Preface: I had written this piece at the beginning of the month (June 4th) and then after I returned to Quito a number of events crowded out the time to post it in it’s rightful order. Now I’m thinking that rather than trash it, I’ll wedge it into the Otavalo/Inti-Raymi postings and disrupt them too. Since I’ve left my comfort cocoon I see that each day is bringing me nonstop experiences. Until now I had been collecting and perfecting them for larger posts, but that presents its own problems. With so much daily input I could end up waiting forever for the perfect wrap. A wrap that really, will never come. So rather than try to bring organization, a totally foreign concept in my life, I will henceforth spew shorter but more frequent postings. Let’s see how this works for me. For you, fractionally more e-mail. At least for those who “Follow” and therefore receive notifications. I’ve been in Lima now for 2 days and I can find some interesting differences between here and Quito. For one, more people I meet seem to know at least some English and are willing to switch languages for my benefit; even when I’d rather continue speaking Spanish. Maybe that’s a hint that my Spanish is worse than I’d like to think. If so, I’ll just refuse the hint and keep on butchering the language. Perhaps the first thing I noticed is that they seem to know how to pour (AKA “place” in the trades) concrete here. After 20yrs in construction culminating in a general contractor’s license, I do know a thing or 2 about mixing cement, sand, and gravel with a bit of water. Sadly, that doesn’t seem to be the case with Ecuadorian construction. I’ve already suffered from poor pours by breaking a bone in my foot stepping on broken concrete pieces a few months back. The sidewalks in Quito are deplorable and inexcusable. And I have stood there and watched new pours and lived in Quito enough months to judge the results of those same pours: the crap they place is so badly mixed that it’s decomposing almost as soon as it cures. COME ON FOLKS: concrete mixtures are not a lost art; 3 components plus water, it ain’t that complex!! Thing is, when I was working in the trades, it was a given that whatever you built, you did so with the expectation that it would last for generations. Nothing was more devastating to a tradesman than to have his (and now, thankfully with gender liberalization, hers too!) work fail. When you built something, by God that construct was going to outlast your grandchildren! I can’t begin to tell you the feeling of pride I got when I revisited something I built 30 years later and saw it looked as solid as when I put it up back in the late 60’s. You don’t see that as much as I’d expect with so many projects in Ecuador. I’d love to meet an Ecuadorian builder for some in-depth discussions about this. I love the country and its people so very deeply but I cannot fathom its construction practices. By contrast, I truly appreciate the sidewalks I’ve seen in Lima so far. Yeah, well I never claimed to be normal, anyway. You have your loves, I have mine. One puzzling issue twixt these 2 Andean countries is economics, and I have no recollections as to whether its micro- or macro-economics that I’m talking about. My college econ courses were too many years ago to remember now which was which. But everything I read and hear says that Peru is a poor country. OK, I get that. Then why are things more expensive here than they are in Ecuador? It’s a given, at least to everyone who talks to me, that the cost of living is higher in Perú than in Ecuador, but why? Please, all you closet economists out there: I’ll buy you a beer if you can enlighten me. Food costs, taxis, hotels and hostels are noticeably higher and I have no clue how that is related to a country being designated as “poor.” Somebody, help me! Another major difference between the 2 capitals is the climate. With Quito kissing the Equator one might expect it to be far warmer than it is. Not so, amigos. Many’s the time I’ve been bundled up in long-johns, a fleece jacket and wool watch-cap, and still feelin’ the chill. Of course sitting on a valley floor at more than 9,000 feet above the sea, surrounded by 16,000 foot volcanoes does have a mitigating effect. Quiteños never tire of reminding me that June is the best month for weather in their city. But, except for 2 days next week, I’ll miss being able to verify that claim. By the middle of the month I will have “closed shop” in the capital and moved on. Perhaps Quito really does have great weather then, but I can say that the first 5 months of the year were less than appealing, with changes every 10 minutes, from sun to clouds to rain to cold and back to sun all over again. The city itself is endlessly fascinating, but the climate is not my favorite to be sure. And yet what I hear about the climate of Lima is also not attractive at first blush. I’m here during the heavy cloud-cover time. It can be downright cool at night and even though my eyes are troubled by bright days (glaucoma), I can leave both my hat and my sunglasses back at the hostel. The clouds never seem to leave and the overcast is very complete and persistent. And when it does get sunny (December to February), it is also hot and humid, which seems like an unpleasant time too. I’ll have to wait and see because the hot season is when I think that I’ll be back for an extended stay. 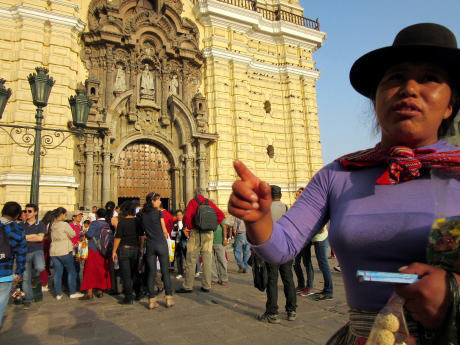 I discovered my “traveling style” while in Quito. Initially planning to be there for a month, I was seduced by its charms, its noise and chaos, and just simply wandering its streets watching it work. So that month became five. I expect the same will happen here in Lima. During an initial meeting with the SAEX/Lima director, Michael Goldsworthy, I learned that the Club has a number of ways for the newcomer to ease into the capital. They publish a hard copy guide to services and attractions of interest to travelers and have updated it regularly. As opportunities arise, Michael invites local experts to present talks about the arts and politics of both the city and the country. There is a Spanish language teacher who includes “hands-on Lima” classes that visit markets, examine how to ride public transport (no simple skill with a completely private “system” of buses, renegade taxis, vans, minivans, etc. ), and other immersive activities which are so vital when landing in a capital of a new country and culture. I’ll be ready for those field-trips to be sure. This past Friday evening I attended a Machu Picchu lecture at the Club. The overall theme, delivered by an explorer who has an intimate 40+ year history with the ruins, seemed to be that a great conspiracy exists. This collusion I’m told, wants to keep the “truth” of Machu Picchu from the rest of us through some apparent Indiana Jones machinations. Entertaining to be sure, but I was actually more drawn to the expat characters who made up the bulk of the audience. The youngest seemed to be from early-middle aged (whatever that category is in these changing days) while the oldest seems to have been on intimate terms with Hiram (the “discoverer” of Machu Picchu) Bingham’s youngest son. This Club, the oldest branch of SAEX, demands further investigation. I’ve accepted the assignment. And I’ve also accepted Michael’s invitation to apply for a room at the club when I do return. Like each of the SAEX branches, Lima has rooms for both short-term and longer stays. It has a kitchen large enough for several travelers at a time, a common area with a large map table and a very large lending library with a separate book exchange.Michael tells me that soon they will also inhabit the downstairs and begin hosting monthly socials like the successful ones held in Quito. This should be in effect before I return. This entry was posted in Indigenous, Otavalo, Quechua and tagged Ecuador, expats, Inti-Raymi, Lima, Perú, SAEX, South American countries, Spanish language on 2015-06-23 by kmalivuk. As I recall, micro refers to single economic actors: one or a few producers, consumers, middle”men” etc. Macro-economics refers to whole systems or large actors within a system such as institutions, cartels, government fiscal policy etc. Determining whether a country is rich or poor is usually taking the total value of all goods and services produced by/in a country and dividing it by its population, a meat-ax approach at best that does not take into consideration the reality on the ground of income distribution, regional variations, economic equality etc. How prices are set involves such things as government subsidies, graft/corruption, competition, transportation and other costs. A poor set of measures for answering a seemingly simple and straightforward question. I don’t know if that clears anything up but at least we know why so many of my students ended up in ZZZZZZZZZZZZZZZZZZZZZZZZZZZZland! Wow! This stuff is really ZZZZZZZZ! No, truly, thanks. There are any number of reports about corruption in Andean countries, with Ecuador seeming to buck the trend. That would go a long way to explaining the disparities between these 2 nations. I do know that Ecuador has very strong price controls and I’ve been reading about major players in Peruvian politics being detained for corruption charges. When you see the abundance of natural resources and high agricultural output that parallels stunning poverty, the stark imbalances are difficult to ignore. Driving across town (in a taxi, I’m no masochist) on my way to the Lima US Embassy, all I saw was modern buildings, expressways, tree-lined neighborhoods. I know, in a city larger than NYC, there are other parts of the metropolis at the opposite end of the economic ladder. But knowing that these modern areas exist shouts that much louder that reform would not be a bad thing in the land of the Inca. Renew your passport! I haven’t replied in a while but I want you to know that I am so enjoying your posts as are a number of our fellow yoga classmates. When I see a new post in my inbox I know I am in for a treat. You are a gifted writer and I would love to read an entire book on your observations and experiences. And I hope when you ever return to HNL we get an opportunity to chat. But as regards Peru, as one who follows economic policy closely, both in the US and elsewhere I would say that Peru appears to be caught in a cycle of neoliberal policy and I am sure you understand what that means as you are very akamai when it comes to the neo-liberals who run things in the US. Both of Peru’s neighbors, Ecuador and Bolivia, along with many others in Latin American, have followed the trend in moving away from this disastrous policy. They both do a good job of explaining all of the above. And will give you new insight as you look around the country. And then we, your readers, will also get a first person account of the real world down in Peru. Until one understand a bit of the politics, both past and present, one will never understand why countries do what they do. It’s great to hear back from you! I thought that I might have scared everyone off with my Natem journeys. Thanks for keeping up. I met a young Chileña psychologist this past weekend. And when we were in a coffee shop discussing SA politics and I mentioned the “Chicago School” she immediately leaped into the middle of the talk and verbally throttled Milton Friedman and the other neo-liberals. What an abominable term: neo-liberal. There’s nothing new or liberal in privatization nor in how it’s destroyed national economies and individual lives. I appreciate the links outlining these disastrous policies. Here in Ecuador, though the middle class is being severely squeezed, the overall quality of life has improved immensely since Correa began his presidency. But there is much worry because no one is now in the wings to take his place. And there’s talk that he may drop out because of his loss of popularity. He couldn’t stand to lose anything, and his overall approval rating is dropping rapidly. But there is no denying that the country has grown markedly since he began. As for Peru, I believe it is a textbook showcase of corruption. The current President seems to be addressing this systemic disease, but he’s got an immense job in front of him. Nevertheless, I’m really looking forward to returning to Lima. It’s really an exciting place. Was that Patsy you’re referring to? If not, I’m awaiting enlightenment; the name’s unfamiliar. I’ve been wondering where you were, haven’t heard in some time. I did hear that you’ve been de Mello-ing and that sounds pretty good. I’m deep into the indigenous life here north of Quito. It’s a different Ecuador altogether, and one that I’m enjoying immensely. Due to head further north in a day or so for more of the same but different. The provincial capital, Ibarra, is off the tourist map, so it calls to me. Right now I’m in Cotacachi, an expat pueblo very friendly, much different from the main expat hole: Cuenca, where everyone talks to no one.